The Buea Archives, that seemed to have been abandoned by Government and is in ruins, will soon be given a facelift. Ama Tutu Muna, Minister of Culture, who was at the Buea Archives, February 18, during a familiarisation tour, said part of her ministry’s budget for this year will be to revamp the Archives and the Museum. “My visit to Buea indicates the concern government has, not only for culture, but for other activities that need to be improved upon. “We are very much aware of the problems of the Buea Archives and we are planning to improve and develop it. We have renovated the building and right now, two staff have been added to the other two who were taking care of the place, and more staff will be recruited in the nearest future,” she said. She thanked Friends of Archives and Antiquities in Cameroon, AFAC, which is an association of benevolent individuals who have been providing incentives to sustain the Archives, for their munificent gestures. “I am here to take stock and see how we can improve on some of the facilities; all cannot be done at once but I think, gradually, we will be able to solve all the problems,” she said. The minister said she wants to create a photo Archives at the Ministry and requested the services of Mola Emmanuel Mbwaye, a veteran photographer, to join her staff to do some photo recollections. For his part, the President of AFAC, Prof. Verkijika G. Fanso of the University of Yaounde I, said since Ama Tutu Muna became Minister of Culture; the Archives have become a department of the Ministry of Culture. He said AFAC was formed on October 15, 1995, due to the deplorable state of the Buea Archives that was abandoned since 1992, and since then, they have been doing their best to make sure that the place doesn’t die down. Prof. Fanso added that, at the moment, some friends of Archives are planning to computerise and digitalise some very frail documents and preserve them for posterity. 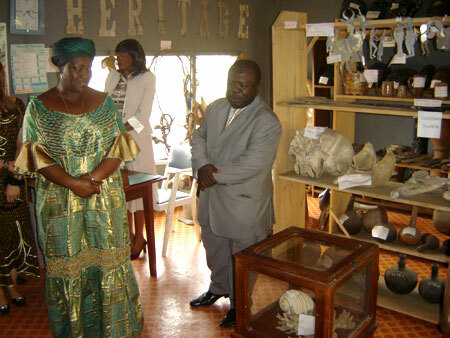 Prior to her stop at the Buea Archives, the Minister’s first port of call was at the Delegation of Culture, where she was received by the Southwest Delegate of Culture, Jean Jacob Nyombe, and undertook a guided tour of the Delegation and the Buea Museum. 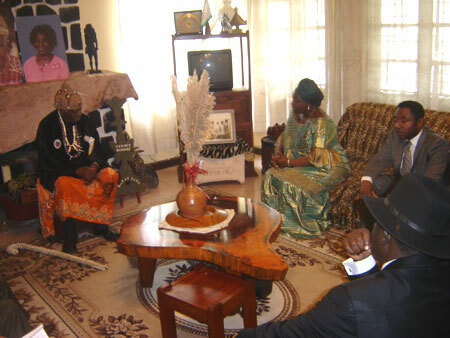 She also visited the Paramount Chief of Buea, HRH Chief SML Endeley in his Palace at Mokunda village. ‘Paper Town’ – © BBC News from Sophia Kyriacou on Vimeo. Copyright © 2014 Cameroon POSTline. All rights reserved.